It’s arrived and there have been enablement webinars (available on KC 11.2 release, Mobile Editing Deep Dive) on this new editor experience. The feedback I and others hear from demonstrations are that many feel this is a better approach for editors. Frank Steffen mentioned on the latest call the features are growing for this mobile editor and supported browsers expanding past Chrome for desktop. Are you using this yet? Do you need a demonstration? Pairing this with a Responsive Web Design refresh will make your editors and end users on mobile devices happy. 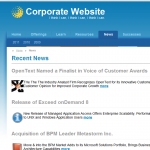 We’ve retrofitted a few existing sites with the new Xample project, the OpenText Services RWD Prebuilt Project and similar designs in less than 30 days. If you want OT to do this for you or just give you a kick start reach out. Want to learn more about WSM & RWD? There is an upcoming webinar from the WSM product team. 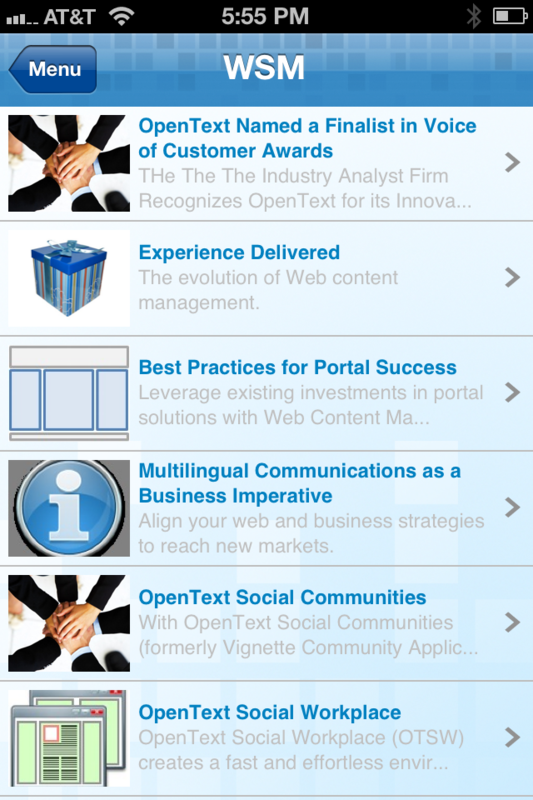 There are number of partners, customers and of course OpenText Global Services working with Responsive Web Designs with WSM. 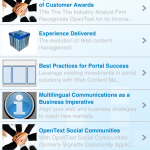 Need help getting started reach out to your preferred integrator or OpenText for help. I’m looking forward to see more launches & relaunches in 2013. 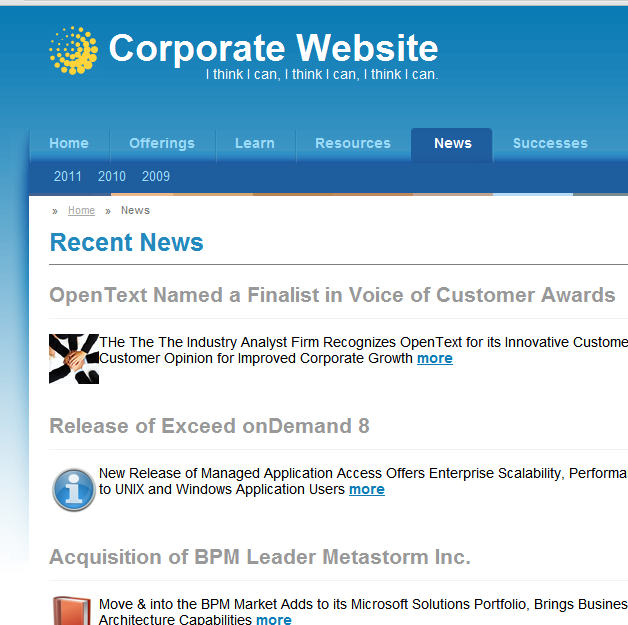 What follows is a simple recipe for creating an OpenText Wave Application filled with content from OpenText Web Site Management. Here’s a view of the template, not much needed. This Delivery Server project already had target DynaMent’s delivering personalized news. 1) Clean up the content for the application a bit. 2) Examine sharing sample configuration (DS Transport Package, MS Content Class Template export& Documentation) to SolEx. This took about 2 days effort scattered in amongst other tasks, having a sample configuration will dramatically cut development time. The next step was generating the query with DS Attributes. Nice thing about SQL is it doesn’t care about line breaks, so you can condense it down to one line. This is good as the XML engine in Delivery Server may not preserve these. I didn’t test conclusively, if you need white-space or formatting for say a REST call you will want to test thoroughly. This is how I broke down the SQL to ‘templatize’ it for Delivery Server. Each line that needs Delivery Server variables is broken out. 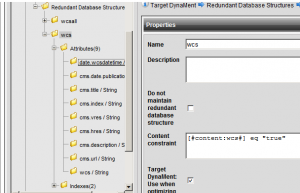 Next prepare to drop it into a DS XML file with pseudo inline attribute syntax. Unfortunately I quickly learned I should have RTFM’d. I ran straight into a blocker. The RDB DynaMent limits the types of commands that can be executed. Thus I seemed out of luck. Except their is the statement mode which I don’t believe I’ve used before. It will let you run unrestricted SQL statements. If you are running simpler queries do use ‘query’ or ‘update’ to help prevent SQL Injection. 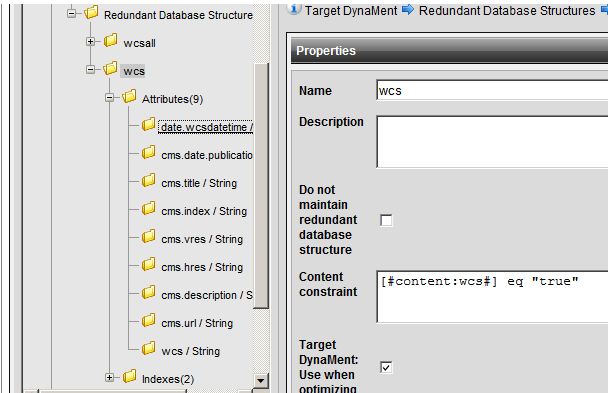 That is the working result of a form handler to work with the “universal” storage tables handling a SmartForm post. In part this week I’m working on a form handling setup. I created a SmartForm and started about writing it’s input to DB via Delivery Server. I decided to make a more generic handler. We have some tools around for processing (client side validation, server side validation, JCaptcha) but no universal storage mechanism at hand. Conceptually this same processing used in tandem with SmartForm, forms created by dragging and dropping from panels in SmartEdit, a template form, or an external or legacy form. I’ve decided to just store this in a couple of tables as it will allow flexibility to integrate with other applications later on. First I created some tables. here they are. I decided I wanted to insert from a form post with one interaction between DS and SQL. For now I decided not to make a prepared statement even though they are supported in v10.1. After struggles with getting to know the output clause and the proper variable syntax I finally got MS SQL 2008 to do all the work. Next step. Writing finishing DS page logic to format the query. Recently in the community I’ve been advocating and drumming up support for DS REST API and Jian, Kim, and Manuel have been discussing MS Plugins using AJAX to call RQL. I recently got an opportunity to give them a test drive to see how they will work for rapid prototyping a solution for a Proof of Concept (POC). I was impressed. 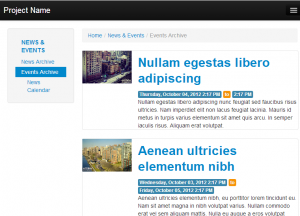 1)DS to display different contents based on date range, resolution, and later an audience category for personalization. 2) Remote access to Asset Manager contents, and on selection return relative paths for where published files would reside. After installing (used the quick start guide for backup) and testing base functionality. I jumped back to Management Server to create contents with metadata to drive the searches. 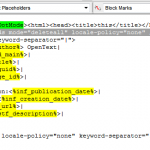 Some assigned by categories and keywords, some by standard fields, and some embedded in the content class templates. 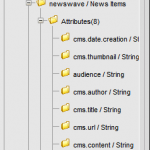 After publishing I created a redundant database structure. I created a new handler by copying the existing Target DynaMent handler. I removed authentication for the handler, as this is a POC it just make things simpler. I developed a query to the specified my parameters. I added a couple DynaMents to write constraints for me based on values of ‘constrainttime’ and ‘hres’. And I had a single content returned per date/resolution. I finished it up by adding a simple HTML XSLT so the content of this one item is accessible as if it were called directly. The rest was some JSP to scrape characters from a URL into a StringBuffer. Much more sophisticated option is possible but it is a POC. Both satisfied the technical requirements as they were understood. Some on the fly reconfiguration during a break was able to more accurately meet the customers requirements. This includes download, install, configuration of REST project. A good amount of this time was spent coding the JSP to include the results of my REST services. I will be honest I’m really a novice with limited hands on experience. Only some rusty revision of existing RQL scripting as background and an existing AJAX plugin as guide. Here is a quick log of an experiment. vFabric tc Server is a Tomcat clone “Enterprise”-ified by the SpringSource now VMWare folks. It has hooks setup into their Hyperic Analysis tool that I’ve been meaning to look at for a while. Install tc Server – pretty easy with 60 day demo. Make sure you have a working SQL 2008 DB up and running. Make sure you create database users. For dev I always make sure to use SQL mixed mode as its much quicker to provision new users. Login to <host>:<port>/cps/rde/iauth with your user and password. Do your own verification of functionality because this is as far as my experiment has gone thus far. UPDATE: Shelly Mao has been very helpful in testing to point out gaps in documentation. This should help those interested setting up their own environments. Currently installing and configuring components for hosted development. Making progress on the API. Two decent code updates in two weeks. Waiting for server provisioning to get new API environment so we can extend access to the community. Have 4-5 non-OT developers looking to help.